After transforming our Ikea dresser and bedside tables into mid-century modern inspired pieces a couple years ago I’ve been in the mood for some more Ikea hacking. My new home studio was the perfect place to start since I needed more storage and didn’t want to spend a ton furniture. I opted to sell my old 2 x 4 Expedit bookcase on Craiglist and buy a new Kallax 1 x 4 bookcase. The Kallax series is really similar to the Expedit, except the shelves are a bit thinner and it uses less wood in manufacturing. I wanted to still have storage for my sewing machine, serger, paper and Silhouette supplies but wanted something that would fit under the window since that space otherwise goes unused. So I turned the Kallax shelving on its side, added some table legs and transformed it into a sideboard table! 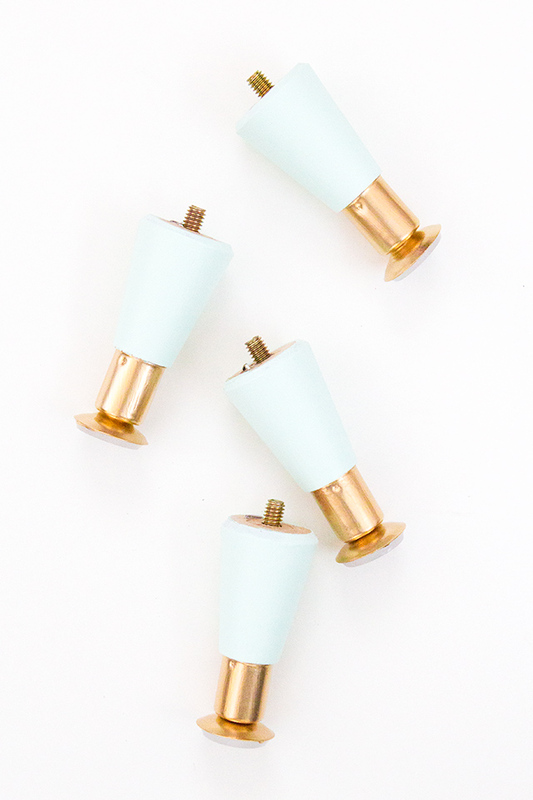 Start by painted the table legs in any color you want. I opted to paint the silver part gold using liquid gilding paint and painted the wood part using some left over Valspar Pantone paint in Bay I had previously used for our open hall closet. Place the top plates right side up, 1/2″ from the edge. Mark only the three corner holes with a pencil and drill holes using a 3/32 drill bit. Then screw the top plate in place. Once all four brackets are on, screw the table legs in place using your hands. Carefully flip it back over and it’s ready to be used! 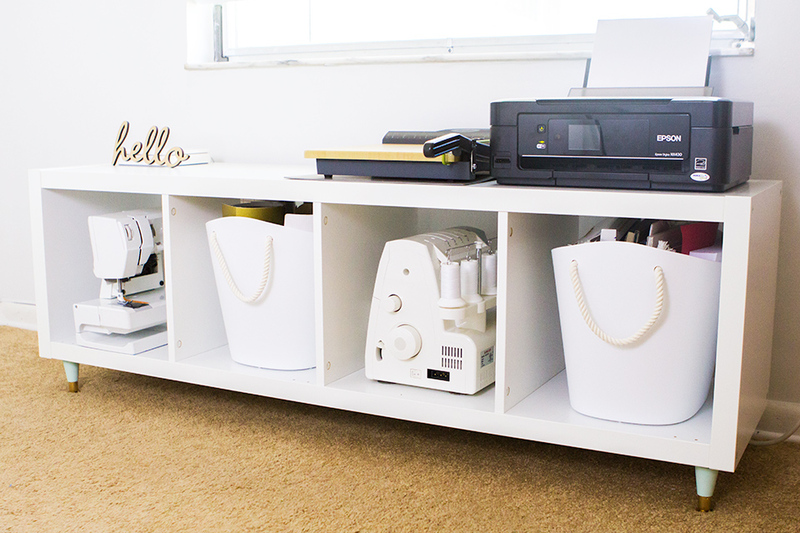 I use two cubbies to store my sewing machine and serger and I used these white plastic totes in the other two to store my Silhouette vinyl and printer paper. Such an easy project with a big impact! I just love how the tiny legs transform this into a more permeant looking piece of furniture. See the rest of my home studio here. 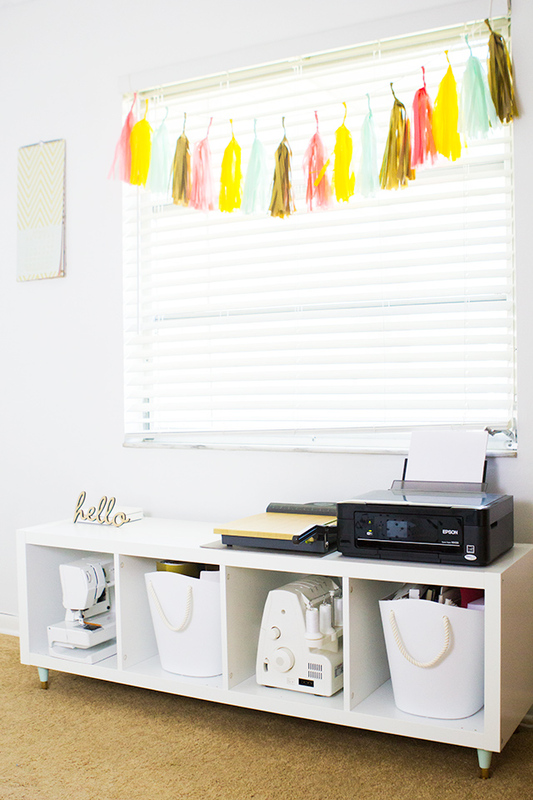 I used to have this shelf in my room growing up, and this is such a great way to repurpose it! The feet you used are also so adorable! What an adorable hack! 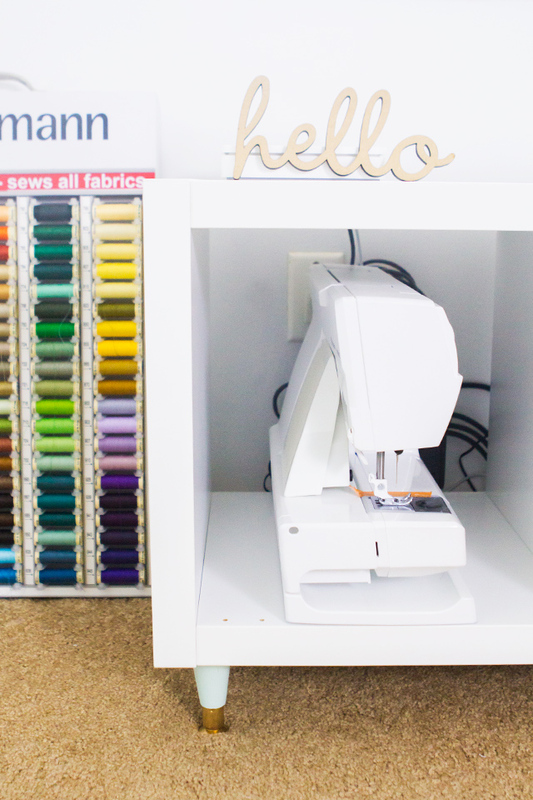 I have one of these (just bigger) and I’m just excited to know my sewing machine and serger will fit in there! Will this work with the Besta media cabinets? Thanks! I haven’t personally tried it, but I don’t see why it wouldn’t! You may need to purchase shorter/longer screws but other than that the process would be the same. Thank you for the reply! I am going to paint my legs today- did you use any primer and/or topcoat?! Thanks! No, I didn’t. I found the painted covered really nicely since the wood was already pretty light. The gilding paint also covers really well. Happy making! Hi love the legs this came out so cute! Where did you find the legs? Thanks Cindy! You can find links to the legs and all other materials used under supplies within this post.